Who is Muse, in 2012? Well, they’re John Barry. He’s one of the most frequent composers of James Bond orchestration, and the cinematic undertones carry through the first song of their new CD, The 2nd Law. Appropriately, there’s an element of dramatic theater to “Supremacy,” which has been a constant in their work. Still, as lead singer Matthew Bellamy rages a familiar rhetoric to overthrow the powers that be, his outrageously high pitch ed vocals make me wonder if he’ll ever make it to the old timers’ circuit in his later years. On the second song, “Madness,” they’re George Michael, with a nod to Bono. At odds are the electronic squirks and the lyrics. One is distracting flash; the other is a love song that’s sung without conviction. For a guy who is at his best railing against things, he falls short in emoting for something. “Panic Station” recalls early 80’s euro-rock/pop, any number of bands that I didn’t like then and don’t like now. “Survival” fits closer with their back catalogue, with fiery guitar, anthemic lyrics, snapping fingers, a corny backing chorus, and a lyric that you might have otherwise guessed was Freddie Mercury’s final act. “Follow Me” intrudes further into Bono’s sanctimonious turf, but once again Bellamy falls short when calling attention to himself. He’s best at pointing the finger at others. “Animals” borrows more than just the distinctive rhythms of Radiohead. The song sounds like I’d like to hear Radiohead today, taking their explorations and marrying them with a focused approach to something recognizable as a song. It holds together well, until the song devolves into chants of a riotous mob. The environment is the focus on “Explorers,” a fairly straightforward and non-aggressive Muse song, on which they sound like... Muse. Still, if this were the “Best of Queen,” it would have a song very similar to this. Falsettos and a clunky chorus sink “Big Freeze.” It sounds like something I’ve heard from Muse before and, well, U2. Hey, with bassist Chris Wolstenholme singing, now they’re Porcupine Tree, or, at least Steven Wilson on “Save Me.” It works. Theater, pomp and circumstance, bombastic over-reaching... typical Muse, returns in full form on “The 2nd Law – Unsustainable.” And, no, please not Dubstep! 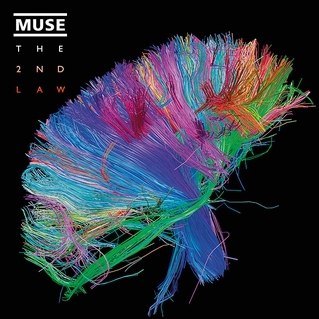 The CD closes with “The 2nd Law – Isolated System. Beautiful piano, pulsing electronics, nice orchestration, and random clutter. It’s interesting exit music for a band that usually pushes things over the top with a big beat. Muse has certainly done something different here. I find myself conflicted because, after many listenings, I cringe at how derivative it is... but I like it.